The cold email is one of the most difficult sales endeavors. It’s not sending them that’s difficult. That’s easy. Trying to get a response is the real challenge. Why is it so hard to get a response? Partly, it’s because there’s a general distrust of cold emails among people today. 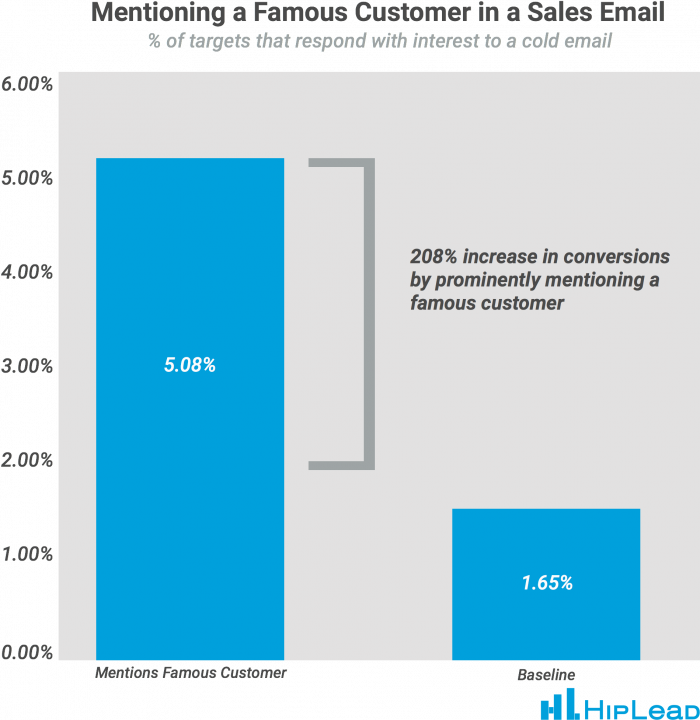 Think about it: How much attention do you pay to cold emails when they enter your inbox? I’m betting that unless the subject line is remarkably attention-grabbing, you probably don’t even open it. That’s why cold emailing is challenging. Because the prospect doesn’t know you and they have no reason to trust you. But you can make it less challenging by adding social proof. 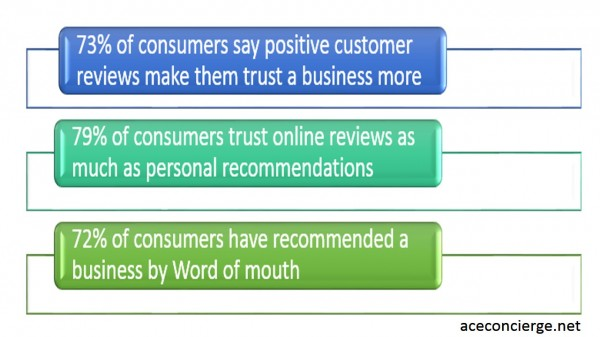 73% of consumers say positive reviews build their trust in a business, 79% trust online reviews, and 72% have recommended a business by word of mouth. But, if you read part one of this article series, you already know that. You’re familiar with what social proof is and why it’s so powerful. You’ve even seen some examples of it in the basic marketing world. In the last article, I showed you how marketers use social proof to add incentive, trustworthiness, and reputability to their advertisements and marketing campaigns. But, in this article, what I want to show you is how you can use social proof in your prospecting emails to build trust. Because here’s the reality: cold emailing is difficult enough. What you don’t want to do is give your prospects a reason to distrust you. They do that without your help. Which means that it’s critical to add credibility to your emails to counteract that potential for distrust. Unfortunately, most cold emails are terrible. 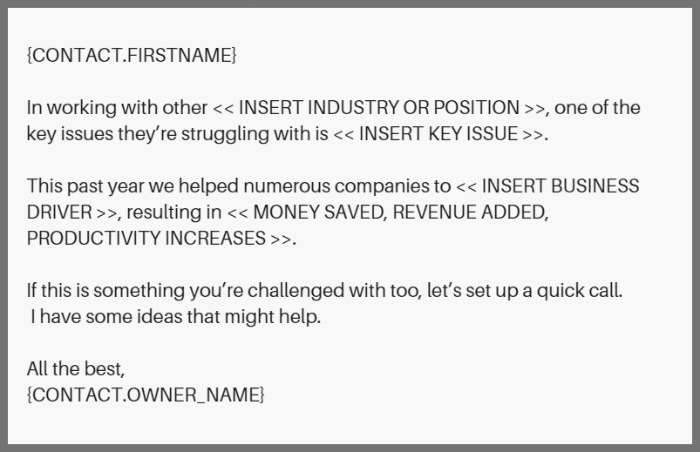 Most cold emails have a generic introduction, body, and conclusion. Luckily for you, there’s a way that you can build trust instead of sow distrust in your cold emailing campaigns. And the answer is social proof. In the last article, we discussed five different types of social proof that exist in the marketing world. 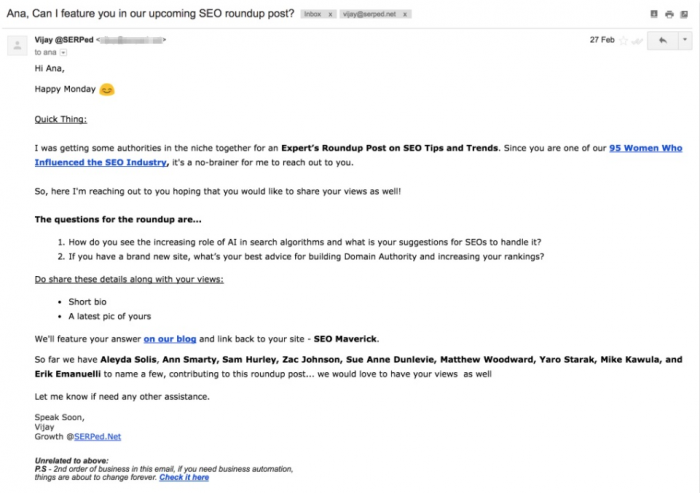 Here’s how you can use these five types of social proof in your emails to win over a prospect. Expert social proof is simple. It’s the “9 out of 10 doctors approve this toothpaste” kind of social proof. And I don’t need to tell you how convincing this is. Think about when you see a book with a lot of quotes from experts in the industry who loved the book. Are you convinced that the book is trustworthy? If you’re like most people, you are. Because you trust the expert, and since the book is associated with the expert, you also trust the book. While we’re talking about books it’s worthwhile to check out Mondovo’s article on 100 Best Books to build your business in 2019. That’s why expert opinion is so powerful. Even for your cold prospecting. 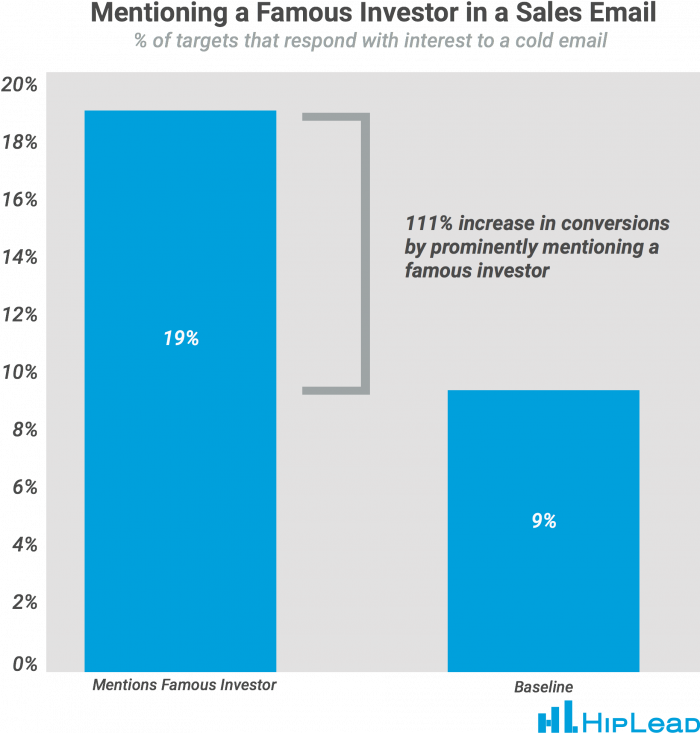 In fact, there’s a 111% increase in reply rate when emails mention a famous investor. 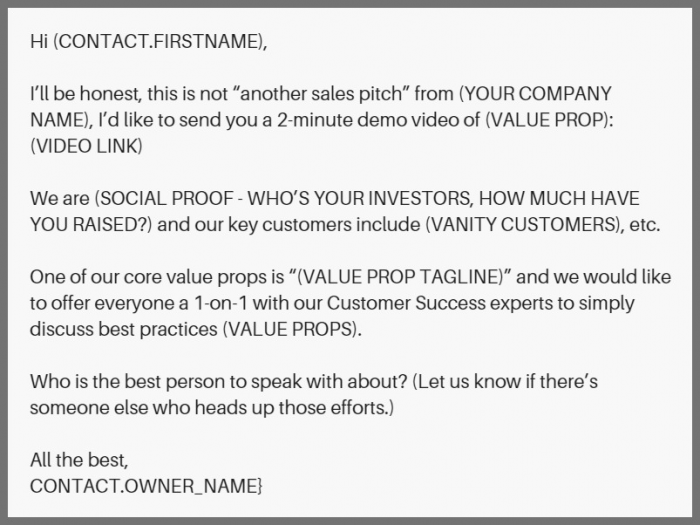 You can use this email template when adding a famous investor into your email to build social proof. Using a famous investor in your emails is a great way to use expert opinion to build trust with the recipients and increase your reply rate. But there’s another way you can add expert opinion to your emails. And that’s by establishing yourself as the expert. Let me walk you through how you can do this. Or by simply using a signature that looks professional. Then, use GMass because it speeds up the often-tedious cold emailing process, allowing me to send up to 10,000 individual emails at a time. You can download the free Chrome extension by going to their website. Then, connect it to your Gmail account. 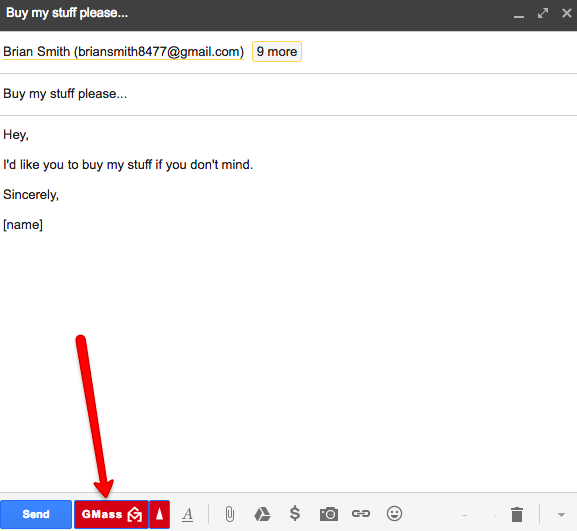 Now, you’ll be able to copy and paste your prospects’ email addresses into the recipient’s section and then click the GMass button to send individual emails to each recipient. However you decide to do it, the important part is to add social proof to your emails that establish your expertise. And leveraging your email signature is a great way to do this. That, or you can add it by quoting another expert say how much they love your business. You can also add expert opinion by talking about one of the bigger clients that you work with. Adding expert opinion to your email signature or quoting other famous investors or customers is a great way to build trust with your audience and show them that you aren’t just sending another boring cold email. The difference between influencer social proof and an expert social proof is the motivation behind why people trust them. People trust experts because they know a lot about the topic and are considered a source of reputable information. If you’re selling a product or service that is new to the audience and thus a bit questionable, the expert opinion is the one you want to leverage. But the influencer builds trust with people simply because they’re likable. People like them, and therefore, they trust them. And influencer social proof is great to use when you’re marketing a product or service that is easy for prospects to understand but requires that extra little kick to push them over the buying edge. One of the best ways of getting influencers to help you out is by asking for contributions to a piece of content you’re creating and then sharing that content in your cold email campaigns. You can ask for contributions by sending something like this. Remember that you want to target influencers in your industry. People that your prospects trust because they like them. This might feel similar to the expert opinion one, but there’s one crucial difference. These people don’t have to be experts. They simply need to be well-known and liked within your industry. I wanted to give you a heads up about a recent article we just published. It’s called [title], and we’re super excited about it. Not just because it’s a remarkably helpful piece of content, but also because… you’re not going to believe this. Guess who contributed to it! That’s right: [name of influencer]! Go check it out and leave us a comment to let us know what you think. This method is a powerful way for turning your cold prospects into warm leads by getting them to engage with your brand on the back of an influencer. 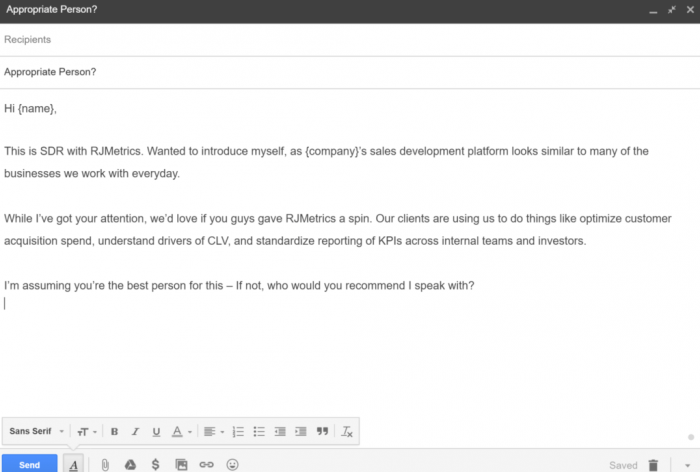 Testimonials are one of the easiest kinds of social proof you can add to your cold emails. They’re simple because they don’t require much effort on your part. All you need to do is talk with existing clients who love you, ask them for a quote, and add something like this to your email. But don’t let that simplicity deceive you. The impact of testimonials far outweighs the effort it takes to include them. Which means that they should be one of your go-to strategies for adding social proof. 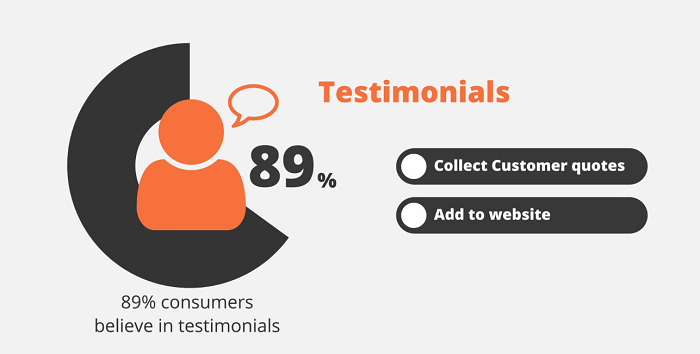 89% of consumers believe in testimonials. Personally, I recommend adding a quote from one of your existing customers as social proof. But there are a few other ways you can get the same effect. You can, for instance, use a case study type of testimonial to build trust with your audience. 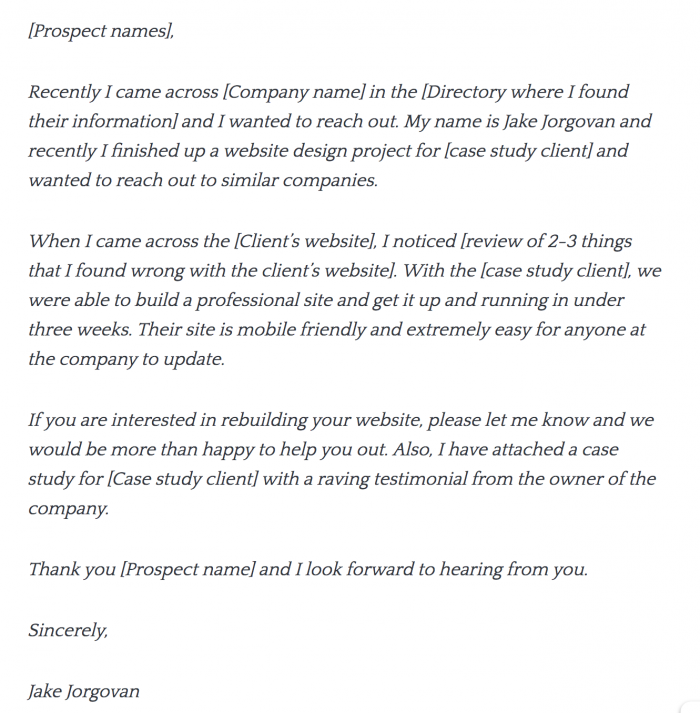 Whether direct testimonial or case study example, you want to make your prospects feel like other people have walked this same road and been incredibly successful. People should feel that working with you guarantees them success. Testimonials provide the evidence they need to believe that. The fourth type of social proof that is valuable for building trust in your cold emailing campaigns is peer pressure. In the last article, I referred to this as the everyone-else-is-doing-it principle. Basically, this is the idea that when the crowd is running in one direction, it’s difficult for you to go the opposite way. Think about it. If you’re walking down the street and a large crowd starts running scared in the opposite direction, what are you going to do? That’s right. You’re going to turn around and sprint out of fear of what they’re running from. One way to create this effect in your cold emails is by mentioning a famous customer who works with you. In fact, doing so can increase conversions by 208%. The goal of this peer pressure is to make your prospects feel like they’re missing out if they don’t work with you. You can also brag about the success of your other clients. Here’s an example of what this might look like. Notice how the below email mentions how the business’s other clients are seeing amazing results. Here’s another email that hits on much the same vein by discussing the success of clients who use the service. By adding some friendly and positive peer pressure to your cold emailing campaigns, you can add incentive for prospects to work with you. They need to know that other people have worked with you before. No one wants to be the first pioneer. So ensure them that they’re not. As we discussed in the first part of this article series, word of mouth is the most effective form of social proof. There’s just nothing quite as effective as someone telling their friend that they love your product. Everyone trusts their friends. And you can leverage that fact in your cold emailing campaigns. But how can you get people to give you referrals? Isn’t that quite difficult? It’s one thing to ask customers for referrals, but it’s quite another to actually get them. Check out Referral Candy’s awesome blog post on referral program examples for inspiration. Well, the stats say otherwise. 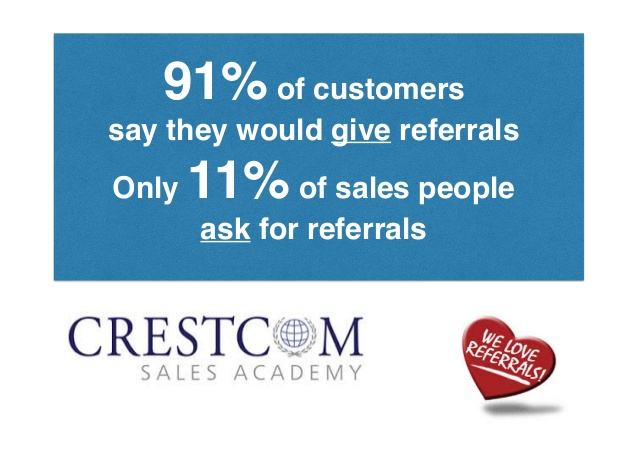 91% of customers say they would give referrals, but only 11% of salespeople ask. But asking for these referrals can be kind of awkward. 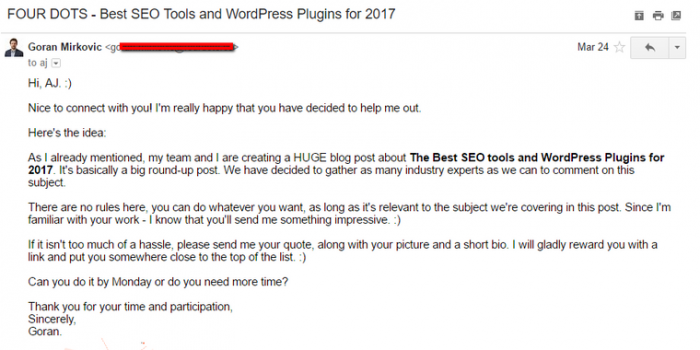 How do you say, “Will you please send me more clients?” without sounding desperate? Here’s an example of an email that does a nice job of asking without begging. Most likely, you’ll be surprised at how many people are willing to tell their friends about you or at least give you their contact information. Especially if they genuinely enjoyed working with you. All you have to do is ask for referrals. And then send an email to the new prospect mentioning the friend who referred them. Voilá! That cold email is now warm because you have a mutual connection. Now you’re ready to go and add trust and credibility to your cold emailing campaigns. You know what social proof is and how it’s used in basic marketing today (part one). 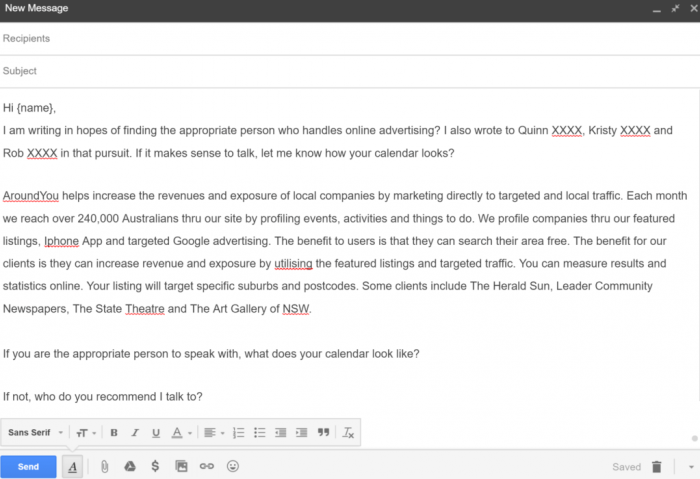 And, you understand how you can add social proof to your cold emails (part two). But the best part about cold emails is that they quickly turn that cold, one-way message into a warm, two-way conversation. One thing’s for sure. All of that social proof will quickly build trust with the people who matter most to your bottom line: your prospects.